I wanted save some layers as PNG files and I had opened a new window for every .png file and pasted in there and sometimes crop it. Is there a way to export just a few or one selected layer and not the whole file much more easily, or maybe only save the visible part as a PNG? Select the Visible Layers Only option if you want to export only those layers that have visibility enabled in the Layers panel. If you use Photoshop CC you don't need any script. You can activate the built-in function "Generator" (File > Generator). This function allow you to export layers and groups when you save the document. Simply rename your layers/group with the extension you need (like nav.png) and eventually the parameters. 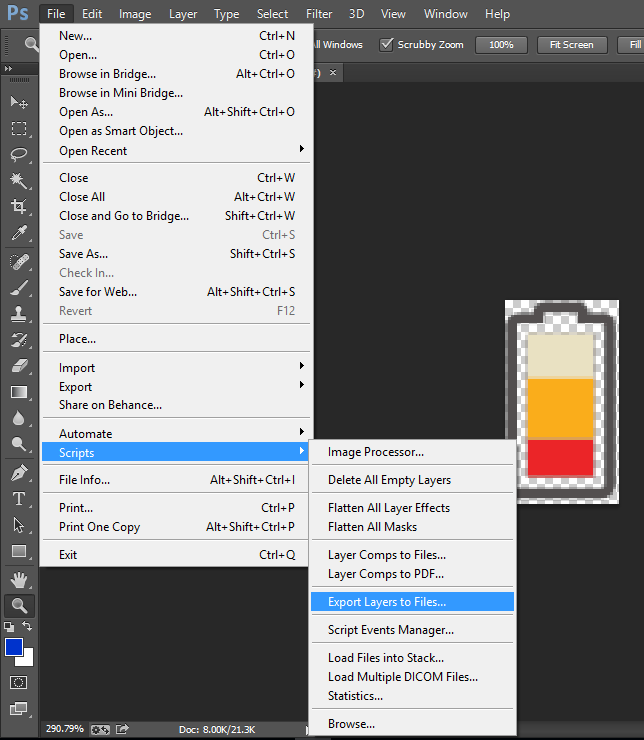 With this method photoshop will export for you the named layers/group visible with associate layer style in the same directory of your file. Skaught's solution works. There are two other options that come to mind. Convert your objects (layers or groups) to smart objects then double click the SO in the layers panel to open a separate, exportable doc. Use slices to delineate and set export prefs for your various objects. You can export by selected slices. In CC 2014, you can use the new feature File>Extract assets that will offer a dialog with all the visible layers and plethora of options (resolutions, prefixes, etc) for extraction. Meant for web-developers this feature helped me out a lot. Too bad it's not available in other versions of PS. From what I understand the feature is still under development and the pesky ".png" in the layer names will be removed, but for the time being watch out for the layer names. Use Marquee Tool 'M' to draw the bounding box. Here's what I found. Single-click layer exporting! Not the answer you're looking for? Browse other questions tagged adobe-photoshop images export png or ask your own question. How do I duplicate/export only the visible part of a layer?